airplane in which he made his historic flight. In July of 1938, pilot Douglas Corrigan filed a flight plan and took off from New York in heavy cloud cover, bound for Los Angeles. Twenty-eight hours later, he landed in Ireland by mistake. He claimed that his magnetic compass had malfunctioned and he had gotten turned around in the clouds and followed the wrong end of the compass needle. The fact that he had applied to the proper authorities several times for permission for a trans-Atlantic flight and been turned down seems to cast some doubt on his official story. His flight caused a minor sensation at the time, and he was paraded down Broadway upon his return, an airport in Texas was named after him, and he met President Franklin D. Roosevelt. The press immediately dubbed him “Wrong Way” Corrigan, and he was forevermore known by that name. For his transgression his pilot’s license was suspended for two weeks. Corrigan had worked at the Ryan Aeronautical Company in San Diego and helped build Charles Lindbergh’s airplane The Spirit of St. Louis. 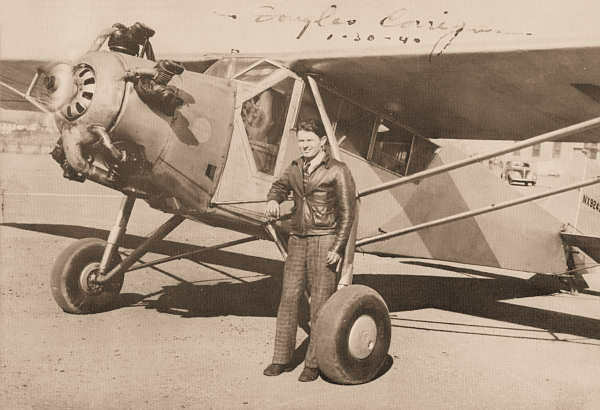 After Lindbergh’s famous flight, Corrigan had decided he wanted to attempt a flight to Ireland. He bought the Curtis Robin airplane he “mistakenly” flew to Ireland for $310 and modified it extensively. Though everyone agreed his “navigational error” was most likely a defiant gesture against the bureaucratic red tape and federal authorities that had denied him permission for his flight, Corrigan never during his lifetime publicly acknowledged flying to Ireland intentionally. After his flight made him famous, he wrote his autobiography entitled That’s My Story, and starred as himself in a movie called The Flying Irishman. He died in 1995 in California at the age of 88. Douglas “Wrong Way” Corrigan has been officially adopted as the patron saint of 101Bananas.com.